I don’t think I can compete with the superlatives bestowed upon bacon on the internet. My love of bacon is not as great as that professed on some sites. I don’t find the idea of chocolate covered bacon appetizing. I don’t even like bacon a cheeseburger. To be honest, I rarely eat bacon by itself. Bacon has, however, become an integral part of my cooking as an ingredient. One of the advantages of moving to Virginia is that there is a history of smoking in the state and, therefore, there are good local bacons available. Those at the farmer’s market are even better. In California, I even made fresh (unsmoked) bacon. When I saw a pork belly at EcoFriendly Foods stand several weeks ago, I knew it was time to try smoked bacon again. This isn’t my first try at smoked bacon. My first attempt used a maple syrup based cure and the bacon was oddly sweet. My next attempt was a more savory cure based on a pancetta recipe. This bacon is a refinement of the second attempt. While it may be self-aggrandizing, this is the best bacon I’ve tasted. The cure ingredients only serve to enhance and complement the natural pork flavor as does the smoke. It’s almost too flavorful to eat by itself. Almost. But that makes it even better when it’s used as an ingredient. Combine the cure ingredients in a bowl and mix well. Place the belly in a jumbo Ziploc bag or other large container. Spread the cure mixture on all sides of the pork belly. Refrigerate the pork belly for 7 to 10 days, overhauling the pork belly by turning it over every other day, until it is firm at its thickest point. Remove the pork belly from the refrigerator, rinse the pork belly, dry it with paper towels, then allow it to dry in the refrigerator overnight on a rack. Hot smoke the pork belly over hickory until it reaches an internal temperature of 150ºF, 2 to 3 hours. Allow the pork belly to cool to room temperature, then chill in the refrigerator. 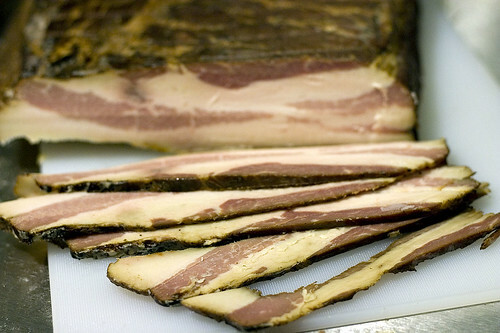 The bacon can be refrigerated for several weeks or frozen nearly indefinitely. Yields approximately 4 lbs/1.75 kg bacon. The last two times we’ve gone skiing in Vermont, my non-skiing wife insisted that we take at least one day and go exploring. For us, exploring consists of visiting cheese makers, ice cream makers, a brewery, and, of course, maple syrup producers. It was an interesting experience visiting several different producers, trying the different grades, and then tasting the differences between different areas and producers. Similar to wine, the terroir makes a difference. After our last trip, we come home laden with more maple syrup, even though we had an unfinished bottle in the fridge from our previous trip. With so much maple syrup in our house, when I first read the title of this recipe in Bon Appetit, I knew I had to make it. I made it when we had planned to have several guests. Instead, only Alison decided to join us. So that meant a lot of cake for me to eat for breakfast and lunch during the week, even after we sent Alison home with some of the leftovers. Surprisingly, given the article that this recipe was part of, this is not a typical cake. It’s sweetness is muted. The cake itself is subdued in flavor while the icing provides a good counterpoint with the dark maple flavor and the tangyness of the cream cheese. This isn’t a particularly difficult recipe but I did have problems getting the maple syrup to mix with the butter and shortening in a smooth fashion. I beat it until the fat particles were relatively small and, in the end, I don’t think it made much of a difference. The original recipe calls for walnuts in the cake and in the frosting, but I omitted them because of Angela’s preferences. Butter and flour two 8″ cake pans. Combine the flour, baking powder, and salt in a bowl and whisk to combine. In an electric mixer, beat the butter and shortening until creamy and fluffy. Add the maple syrup and beat until the mixture is smooth, 3 to 5 minutes. Add the egg yolks and the egg one at a time, pausing until the mixture is well combined before adding the next one. Beat in the flour in 3 additions, alternating with the milk. Divide the batter evenly between the two pans. Remove from the oven, allow to cool, then remove from the cake pans. To make the frosting, beat cream cheese and butter until smooth. Add the powdered sugar and maple syrup and beat until just combined. 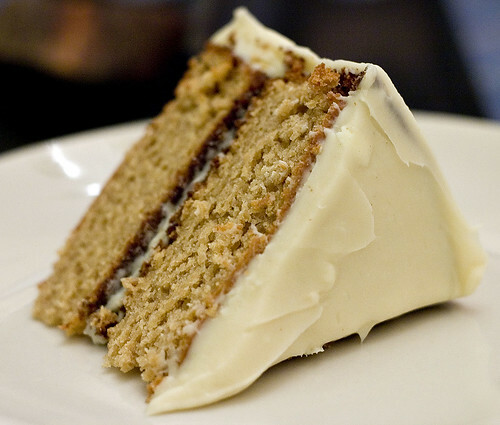 Make a layer cake, by icing the cake with the frosting. In honor of health care reform passing last night, I thought we should eat some fried foods. That may be the best form of socializing risks that I know of. In reality, I had bought some shucked oysters at the farmer’s market and had already been planning to fry them. 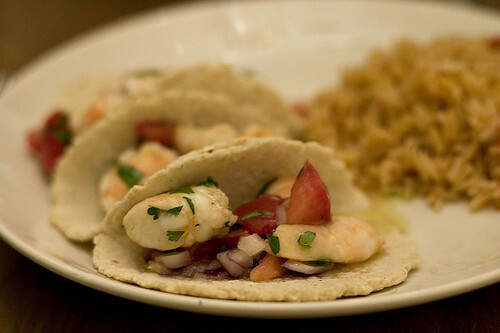 We’ve been lucky that a seafood vendor has been attending the farmer’s market. Initially, they had only agreed to attend during the winter. Given the quality of their products (particularly, the rock fish), to encourage them to continue attending as well as to eat more seafood, I decided to try and buy at least one thing from them every week. Last week was clam chowder. This week, at Angela’s encouragement, was fried oysters. Despite being from and currently living in the Chesapeake Bay area, I’ve had little experience with oysters. My parents don’t like them (or at least think they don’t), so I never ate them growing up. My first experience with them was at a local restaurant; from there, I was hooked. Angela’s obsession started after eating a fried oyster topped burger in Boston. I also must admit that the recipe I use for frying oysters comes from a New Englander. In my defense, my lack of Chesapeake Bay cookbooks not withstanding, it’s really quite good. It’s also said to be a “southern style” fry mix. And while most Marylanders would probably put Old Bay on the oysters, it would probably overpower the mild taste of the sweet oysters I’ve been buying. I like to serve fried oysters with french fries. 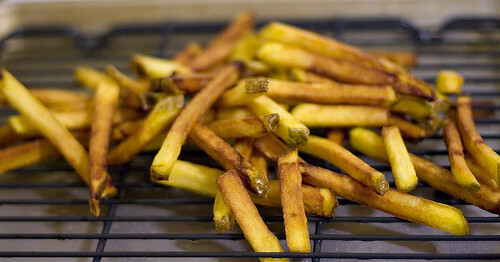 If I’m taking the time to start deep frying, I might as well make some french fries while I’m at it. Plus, it makes a convenient “one pot” meal. If you want to make french fries, I’d suggest cooking them before the oysters. The oysters cook very quickly and can add odd flavors to the french fries. For the dredge, don’t use a very coarse cornmeal (i.e. polenta); it will make the oysters too gritty. However, I would recommend a stone-ground cornmeal if at all possible. For the frying, I like to setup two half-sheet pans, each with a cooling rack on top. One sheet pan gets the dredged but uncooked oysters. The other sheet pan can be used to rest the cooked oysters. 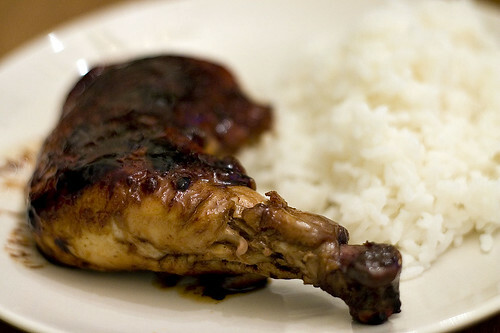 Heat the oil in a large dutch oven to 360°F. In a bowl, put the buttermilk. In another bowl, mix together the dredge ingredients. Dredge each oyster, first through the buttermilk, then through the dry ingredients. Set aside. Deep fry the oysters at 360°F until they are lightly browned and cooked through. Initially, the oil will boil very heavily, when the oil subsides and boils lightly, the oysters are done (the change is distinct). 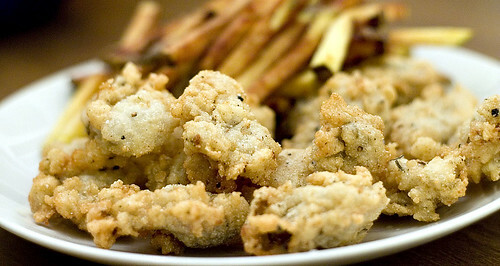 Remove from the oysters from the deep fryer and allow to drain for a minute. Season the oysters with salt. Serve immediately with cocktail sauce. It has been raining on and off since Friday. Yesterday, when I went to the farmer’s market, it was more on than off. As I was driving there and the rain started to let up, I was hopeful that my shopping would end up being dry; I was wrong. With the raining come down as I stood half covered by the awning of the seafood vendor, I decided that the only appropriate option would be clam chowder. I’m not from New England. I’ve only been there a handful of times and I’ve never eaten clam chowder there. Previously, clam chowder was a bland, generic milky soup that either came out of a can or was served at a generic restaurant. Despite all the bad versions I’ve had, the Platonic ideal of New England clam chowder has always appealed to me. Somewhere, there was a creamy but flavorful soup that actually tasted of clams. This may not be the form of the perfect clam chowder but it’s still quite good. I’ve made this recipe a few times now and it’s always worked out for me. The original doesn’t include any cayenne pepper or Tabasco but they both help to cut through the brinyness of the clams while not overpowering the flavor of the clams. On this rainy, chilly night, clam chowder matched the mood. With a sliced baguette to sop up the broth, it was nearly perfect. Melt the butter over medium heat in a large dutch oven. Add the bacon and cook until well browned and the fat rendered from the bacon. Remove the bacon and drain on paper towels. Add the onion, garlic, half the thyme, and celery to the dutch oven. 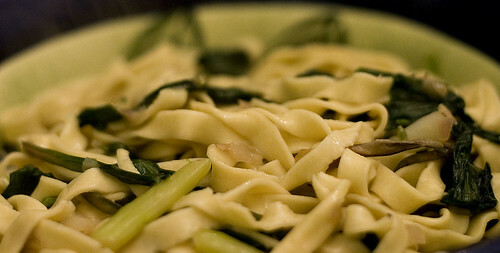 Season with a pinch of salt and book until the vegetables are soft and lightly browned, about 10 minutes. Add the potatoes and cook for 3 minutes. Add the reserved clam juice and bottled clam juice. 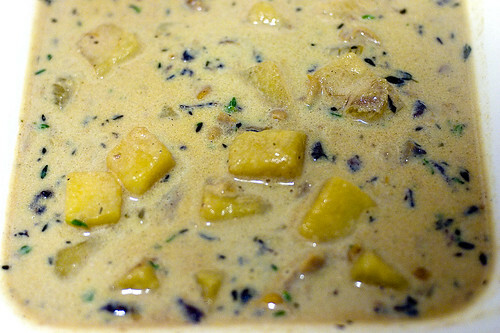 Bring to a simmer and simmer until the potatoes are soft, about 15 minutes. Add the clams and simmer for one minute more. Add the heavy cream and simmer until the cream thickens slightly. Season with salt, black pepper, cayenne pepper, and Tabasco to taste. Add the remaining thyme and the bacon, stir well, and serve immediately with bread.